H2 is the smallest bio-available molecule in the universe, representing 90% of living matter. When infused in water it provides multiple benefits, including increased energy and antioxidant activity. HydroTab puts the power of molecular hydrogen in your pocket. Molecular Hydrogen supports production of the body’s own in-house antioxidants such as Glutathione and SOD. Unlike popular antioxidant therapies such as Vitamin E mega-dosing which wipe out all free radicals including useful ones, H2 only goes after the very worst, preserving the balance of the antioxidant/free radical ecosystem. Molecular Hydrogen is the smallest molecule in the Universe, enabling it to not only penetrate the blood/brain barrier, but also pass easily through cell walls into the nucleus where it is utilized by mitochondria for healthy cell signaling, cell metabolism, and healthy gene expression. Help stimulate energy metabolism to experience more energy, healthier metabolic function (including potential weight loss), mental alertness, and focus. Fight age-related energy loss and find more of the energy you had when you were younger. Molecular hydrogen infused water has been shown in two studies to be an effective hydration strategy3. Furthermore, pre-exercise use reduced blood lactate levels and improved exercise-induced decline of muscle function4. Σ The HydroTab product is not intended to treat any of the conditions mentioned in molecular hydrogen studies, nor is there any evidence that the HydroTab product will provide any benefit to people with these conditions. However, if you are interested in the science on molecular hydrogen generally, please visit our research page. Creates maximum PPM hydrogen-rich water in less than 2 minutes in an open container. Up to 10 ppm. 80mg magnesium. The natural and proven HydroTab formula is a proprietary blend of pure magnesium and malic acid that generates hydrogen-rich water in minutes. Malic acid is produced within the mitochondria and supports the body’s energy reserves while improving mental clarity and reversing muscle fatigue. The other ingredients are organic binders necessary for structural functionality of the tablet. How much molecular hydrogen does each tablet produce? HydroTab offers the highest concentration of molecular hydrogen on the market today at 10 Parts per Million (PPM) in 500ml of water. Our groundbreaking formula makes it possible to get therapeutic levels of H2 in an open container. One tablet dropped into a glass of water will create hydrogen-rich water in less than 2 minutes. Drink immediately for maximum benefit. 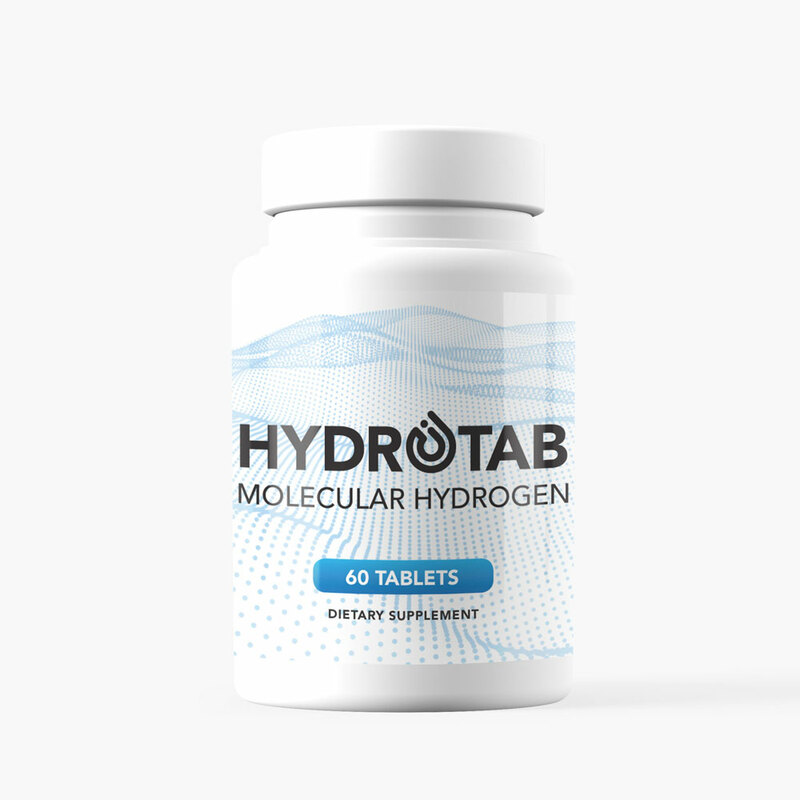 The HydroTab product is not intended to treat any of the conditions mentioned in molecular hydrogen studies, nor is there any evidence that the HydroTab product will provide any benefit to people with these conditions. However, if you are interested in the science on molecular hydrogen generally, please visit these websites. Create fresh hydrogenated water on the go, anytime. Simply drop a HydroTab into a glass of water and watch as a nano cloud of molecular hydrogen supersaturates the water. It will be ready to drink in less than 2 minutes. Do not swallow tablet. Best taken on an empty stomach, but not necessary. Start with 1-2 tablets dropped into water to start. Increase up to 6 tablets per day as desired based on how they affect you. Consider your level of stress and/or physical activity as well. H₂ hydrating drinks are especially beneficial for endurance sports and states of high stress. In over 80 years of inhaling H2 for deep-sea diving, there is no evidence at all of molecular hydrogen having a toxic effect on the body. Any hydrogen that your body does not use will naturally dissipate. HydroTab molecular hydrogen tablets leave water with a smooth, fresh mouth feel that customers say tastes lighter and fresher than plain water. The magnesium can leave a mild metallic for some users, but so mild as to not be offputting. What kind of container do I need? Its simplicity is brilliant: Just drop a tablet in a glass of water and wait until the HydroTab has fully dissolved into millions of nano H2 bubbles. No need for a closed lid container, special hardware, or transportation worries. Drink immediately for maximum effect. Its simplicity is brilliant: Just drop a tablet in a glass of water and wait until the HydroTab has fully dissolved into millions of nano H2 bubbles. No need for a closed lid container. Drink immediately for maximum effect. Read more about Molecular Hydrogen, its uses and benefits in these noteworthy publications. Get the latest updates on molecular hydrogen and special offers from HydroTab. Only the good stuff - never spam.